Returning for its second year, The Big Jewish Summer Fete attracted around 1000 people on Sunday 10 June at Highbury Fields, Islington. 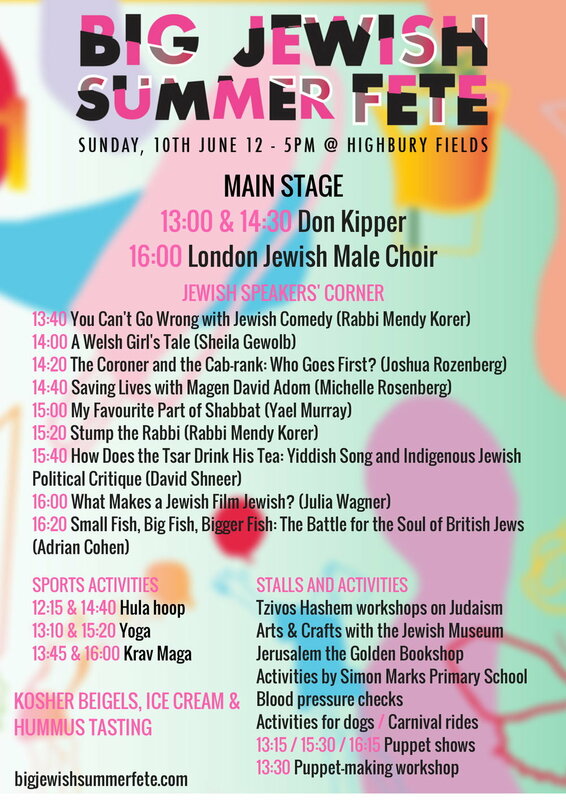 Don Kipper and the London Jewish Male Choir performed on the main stage, while the Jewish Speakers' Corner featured a series of short talks on Judaism and Jewish culture: from Jewish film or Yiddish songs, through personal stories and 'everything you always wanted to know about Judaism but were afraid to ask', to stand-up comedy and commentaries on law. Activities included special workshops on Judaism by Tzivos Hashem, arts & crafts by the Jewish Museum, kosher ice cream and bagels, and hummus tasting, while free Krav Maga, hula hoop and yoga workshops got participants moving. The event also featured puppeteering shows and puppet making workshop, bubble show, pet activities by Islington Council, stalls by Simon Marks Jewish Primary School and Stroke Association, and Police minibus.